It was billed as everything from “The Money Fight” to the “Biggest Fight in Combat Sports History.” In reality, it was one of the world’s greatest professional boxers against an amateur level boxer. In that context, it wasn’t really a fight at all and the Las Vegas odds makers predicted just that. The Telegraph predicted that McGregor would walk away with at least $75 million USD, while Mayweather would walk away with over $200 million. Incredible to imagine that an amateur level boxer would make more money than 20 UFC Championship fights combined! Interestingly, McGregor made more money than even Mike Tyson’s biggest payout even when adjusted for inflation. So why the heck would Conor McGregor make so much money? Based on his boxing skill level, he shouldn’t have made anywhere near that much money. In fact, he shouldn’t have even been able to step inside the same boxing ring as Floyd Mayweather. Based on the fact that professional boxers, who have honed their craft over a life time, don’t make anywhere close to $75 million per fight (outside of Mayweather and Manny Pacquiao), isn’t it insulting that Conor McGregor made that much money? The truth is that the money made in this fight was not about boxing skills at the end of the day. Yes, Floyd Mayweather is the greatest present day boxer in the world, but his payday is bigger than the biggest payouts of Mike Tyson and Muhammad Ali combined, even if you adjust for inflation. This fight was all about people wanting to see it. There was, of course, a huge element of curiosity about seeing boxing versus MMA on boxing’s home turf, but that was only the start. Leaving it at MMA versus boxing would not be interesting to many boxing enthusiasts who would simply write this off as a gimmick in which the MMA fighter would be lucky to walk out of the ring on his own feet. The thing is, as the fight approached, more and more people started predicting a McGregor victory and many more were rooting for him to win, even if they believed he would lose. Why? Because he projected confidence and really truly made people believe in him. People rooted for him because he projected a fun charisma. People rooted for the scrappy Irishman underdog to bring Floyd Mayweather back down to earth. Each athlete carefully crafted the story line and their promotion through social media, YouTube, press releases and press conferences. Mayweather played down his boxing superiority and made himself the bad guy while Conor played up how hard he was training and made himself the good guy that everyone would root for. All of this added up to thousands in attendance and millions watching around the world (even boxing enthusiasts) and hundreds of millions in revenue generated. You see, the prize purse in this fight was based on pay-per-view sales, ticket revenue and sponsorships. Conor McGregor could not even dream of making $75 million as a boxer based on his skill level, but his charisma and ability to promote and play the story just right ensured that everyone wanted to watch him take on a far, far, superior boxer. In fact, this formula holds true at all levels of professional boxing. The professional boxer just starting out with 6 round fights at a small casino works to promote himself in the community, build a following and even sells tickets himself to get butts in the seats because he wants to make a reasonable paycheck for his efforts. The promoters give bonuses if he can knock his opponent out because that’s the entertaining way to end a fight. Bonuses aren’t given on winning 6 rounds on points based on incredible technical boxing. The boxer then grows his following and the people who just watched his entertaining fight spread the word and put more butts in the seats the next time. If a boxer fails to get butts in the seats, the money doesn’t follow. A base contract typically starts at $500-$1000 for a professional boxer. Being a professional fighter in the UFC doesn’t make you an instant millionaire (as many have pointed out regarding their lacklustre prize purses) or instantly famous, but neither does being a professional boxer (quick – without looking on Google, who is the current WBC Heavyweight Boxing Champion?). UFC isn’t promoting this fight; WBC isn’t promoting this fight – they are simply providing amplifications to the promotions that the fighters themselves are doing. 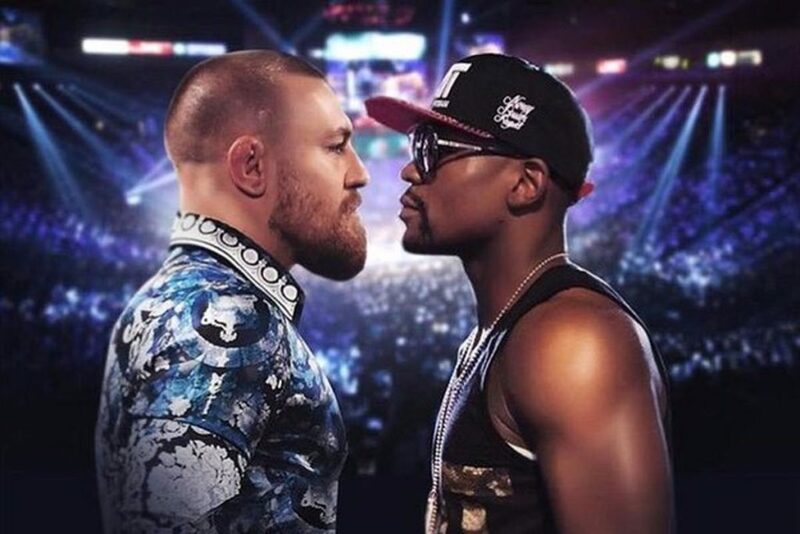 It is the fact that McGregor and Mayweather successfully built up hype leading up to their fight that led to the biggest payday for any individual athlete in history. Bringing this back to the fitness and bodybuilding world, having an IFBB PRO card or UFE PRO card or any other PRO card for that matter means very little in terms of success measured in money or fame or being able to sell products or services. Yes, it’s a great personal accomplishment and notes a certain level of ability in the sport, but it doesn’t translate too much else. Yes, Arnold Schwarzenegger had an IFBB PRO card, but his success revolved around his charisma and showmanship and his ability to build hype around himself which is why no one in the fitness world has duplicated his success to date, even though modern bodybuilders are bigger and more ripped than ever. Kayla Itsines would likely not even be competitive on a professional fitness stage, but that doesn’t stop her from getting nearly 8 million Instagram followers and more than 50,000 likes on her posts and more than $40 million in her bank each year. You can also bet that if she ever did decide to compete, she would put a lot of butts in the seats! Fitness and bodybuilding competitors often mention how much money they invest into competing and don’t receive much in return, even at the PRO level, but they forget that it is up to them to change that. Organizations can provide a platform to promote oneself and they can even try to build up as much hype around the event and the competitors as possible, but without the active participation of the competitors themselves in building up hype, the event will not be successful. It is great that you have trained hard. If you have earned PRO status with any organization, you should feel proud and accomplished, but you can’t expect any more than that if you’re to simply say, “Hey, I worked hard and look great, now give me something.” Now that you look amazing and have a platform, you must actively promote yourself. Build a network and get them to come and watch you, either in the seats or through any other available medium. If an event isn’t successful and doesn’t make money, how can you expect to get anything back? A professional UFC fighter who fails to put butts in the seats is making less than $22,000 per fight, despite the fact that they have trained and sacrificed their entire lives. Maybe it doesn’t sound fair, but in order for an organization to be able to pay big dollars, they need to have sufficient revenue to pay for their production and pay themselves so they can in turn pay the talent. There is potential for fitness and bodybuilding competitors to earn bigger prize purses, secure more sponsorships, earn more recognition and earn more money from products and services they choose to sell, but it comes down to their ability to promote themselves, the organizations they compete with and the events they compete at. Just take it from Floyd and Conor.